German Protestant reformer, born on the 3rd of December 1483 at Torgau, on the Elbe. He was educated at Leipzig, and then at Wittenberg, where he was one of the first who matriculated (1502) in the recently founded university. He soon obtained various academical honors, and became professor of theology in 1511. 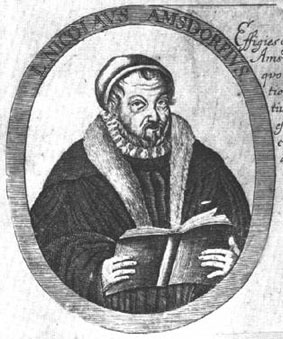 Like Andreas Carlstadt, he was at first a leading exponent of the older type of scholastic theology, but under the influence of Martin Luther abandoned his Aristotelian positions for a theology based on the Augustinian doctrine of grace. Throughout his life he remained one of Luther's most determined supporters; was with him at the Leipzig conference (1519), and the diet of Worms (1521); and was in the secret of his Wartburg seclusion. He assisted the first efforts of the Reformation at Magdeburg (1524), at Goslar (1531) and at Einbeck (1534); took an active part in the debates at Schmalkalden (1537), where he defended the use of the sacrament by the unbelieving; and (1539) spoke out strongly against the bigamy of the landgrave of Hesse. After the death of the count palatine, bishop of Naumburg-Zeitz, he was installed there (January 20, 1542), though in opposition to the chapter, by the elector of Saxony and Luther. His position was a painful one, and he longed to get back to Magdeburg, but was persuaded by Luther to stay. After Luther's death (1546) and the battle of Mühlberg (1547) he had to yield to his rival, Julius von Pflug, and retire to the protection of the young duke of Weimar. Here he took part in founding Jena University (1548); opposed the "Augsburg Interim" (1548); superintended the publication of the Jena edition of Luther's works; and debated on the free will, original sin, and, more noticeably, on the Christian value of good works, in regard to which he held that they were not only useless, but prejudicial. He urged the separation of the High Lutheran party from Philipp Melanchthon (1557), got the Saxon dukes to oppose the Frankfurt Recess (1558) and continued to fight for the purity of Lutheran doctrine. He died at Eisenach on the 14th of May 1565, and was buried in the church of St. George there, where his effigy shows a well-knit frame and sharp-cut features. He was a man of strong will, of great aptitude for controversy, and considerable learning, and thus exercised a decided influence on the Reformation. Many letters and other short productions of his pen are extant in manuscript, especially five thick volumes of Amsdorfiana, in the Weimar library. They are a valuable source for our knowledge of Luther. A small sect, which adopted his opinion on good works, was called after him; but it is now of mere historical interest.